Hard Metal’s long association with Hartner gives us exclusive access to this high quality full-line drilling range. From HSS & HSCo Twist Drills and INOX Drills to high precision Solid Carbide TS-Drills, Hartner stock a comprehensive range of tools in metric and imperial sizes. Daily shipments from Germany ensure we provide a superior service to complement this quality drilling brand. 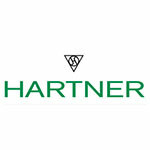 Company profile Hartner was founded in 1879 by Gustav Hartner. In 1911 Gustav extended his product range from scales and weights to include precision drilling tools. The production of precision drilling tools and equipment for manufacturing these tools became the most important part of the company. Today Hartner's range consists exclusively of precision tools – more than 20,000 in all.